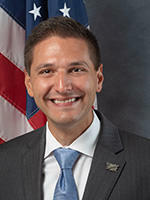 Republican State Representative Danny Burgess Jr. Governor Ron Desantis wants Danny Burgess Jr. to head the Department of Veterans Affairs. During the required public interview Friday morning before the state cabinet, Burgess addressed homelessness and mental health. He urged medical marijuana as a potential treatment for veterans. “The great thing about the FDVA is that we work hand-in-hand with the federal VA and we do help assist those people who may have fallen through the cracks … and help them get the benefits they deserve”. Burgess called attention to some of the more pressing issues Florida’s veterans face. Burgess also sees a veterans court in every circuit as a dire need. The cabinet will make a final decision at a later time. If approved, he will replace interim Director Glenn Sutphin.